Today I met my good friend Betty for a day of shopping (mostly window style) and camaraderie. Betty and I met through my blog. In fact, she is my most faithful reader! We discovered we lived in the same town, so decided to get together in real life. It has been great fun. One of our favourite places to meet is Historic Fairhaven. In 1889, the railroad was coming, and Fairhaven grew rapidly, hoping to become the west coast terminus. The railroad connection never worked out, so the new town turned to the sea and fishing for its economic base. In its heyday, Fairhaven was a bustling town of hotels, shops, saloons and brothels. Today, the brothels are gone, but the rich heritage of hotels, shops, restaurants and nightlife remains. And Fairhaven has achieved its original goal of becoming a tranportation center with its Alaska Ferry, Amtrak and bus terminal. 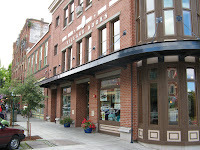 One stop in Fairhaven that we love to make is the Eclipse Bookstore at 1104 11th Street. The Eclipse Bookstore is amazing with its vast variety of books covering the two floors of the establishment. Because it's a used book store, the prices are also amazingly low. Today, I got three books by R.D. Lawrence, a renowned Canadian author. To fortify ourselves before wandering the shelves, we stopped in at Avenue Bread at 1135 11th Street. Avenue Bread is across the street and within easy walking distance. In addition to their wonderful fresh breads (I chose the sourdough with rosemary - YUM), they have a small cafe. We could have chosen soup, salad or sandwiches to go with our coffee, but opted for some of the fresh baked treats. Betty had the ham and cheese croissant and I got the cinnamon twist (double YUM). A trip to Fairhaven wouldn't be complete without a visit to Village Books at 1200 11th Street. They have mostly new books, but you will also find good used books among the collection. Stop by and check them out. Well, we weren't as high as airliners (35,000 and 45,000 feet above sea level), but we were up at 8500, high enough to get a good bird's eye view and stay out of the convection bumps. This morning's ATC (air traffic control) assistance came from a new source, the military. Because we were flying under instrument flight rules (IFR), Concord Tower immediately handed us off to Travis Approach. Each section of airspace has only one controlling agency. In the vicinity of Travis Air Force Base, it's managed by base personnel. Civilian airplanes passing through are given the same service as military aircraft. We chose to fly IFR for practice, and because it's helpful to receive ATC assistance especially in congested airspace such at the Bay Area. Wayne has an IFR and instructor rating, so I help with the flying. We've become a well tuned machine when it comes to cockpit management. I usually do the takeoffs, while Wayne handles the routes and radios. Once things settle down, our third "pilot" steps in. That's George, the autopilot. He takes over enroute, but we still have to tell him where to go and how high. Once in a while he tries some funny stuff, but we are always watching. Today's flight took us up Victor 27 along the California and Oregon coast. Victor Airways are low level routes (below 18,000 feet) created by navigation aids such as NDBs (non-directional beacons) and VORs (VHF omnidirectional range). 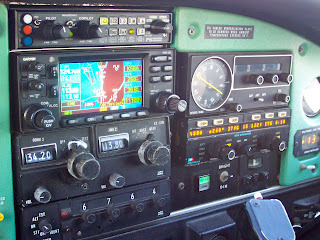 Instruments in the cockpit pick up the radio signals, allowing pilots to follow the airways from point to point. Airways are very important in IFR flight, but any pilot can use them for navigational purposes. Today, satellite technology and GPS are revolutionizing flight navigation. 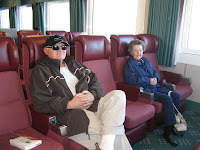 We started early to get through the overland section of Victor 27 from Concord to Arcata, California. On hot days like today, rising hot air can make for a bumpy ride. But we made it through fine. We stopped after only two hours of flying at Arcata Airport, so we could reward ourselves with some breakfast at the Silver Lining Restaruant and to top off our tanks. The next leg took us to Tillamook, Oregon, and a "small world" experience. Our good friends Ken and Sam from Gibsons BC were on a driving trip. We arranged a met-up at the Tillamook Airport. Tillamook is well known for their cheese factory and for aviation enthusiasts, the Air Museum with its many warbirds. There's even a camping area on the field if you are so inclined. We'd planned to spend another night along the Oregon coast, but the possibility of a storm moving in tomorrow pushed us on to our home base in Bellingham, Washington. At Astoria, Oregon, we turn up the mighty Columbia River on the way to Olympia, over Whidbey Island and finally Bellingham International Airport. The total flight time from Los Angeles was 10 hours, but in two-hour legs it wasn't so bad, especially with the overnight break at Concord. It's fall and here are 10 reasons you should make Powell River, BC your fall travel destination. 10. An exciting ferry ride to get here. No matter what time of year, the ride on BC Ferries to Powell River in an E-ticket ride. You can easily turn your visit into a Circle Route vacation. Check out the Experience Card for extra savings. The maples are turning and snow is starting to cap the towering peaks. Sit back, relax and take in the view. 9. Locals know. Talk to some locals on your ferry ride. They'll gladly share some of the history and highlights of our unique region. Stop at the Tourism Powell River Visitor Centre in the Crossroads Village Shopping Centre next to Quality Foods on Mondays through Fridays 9:00-5:00. 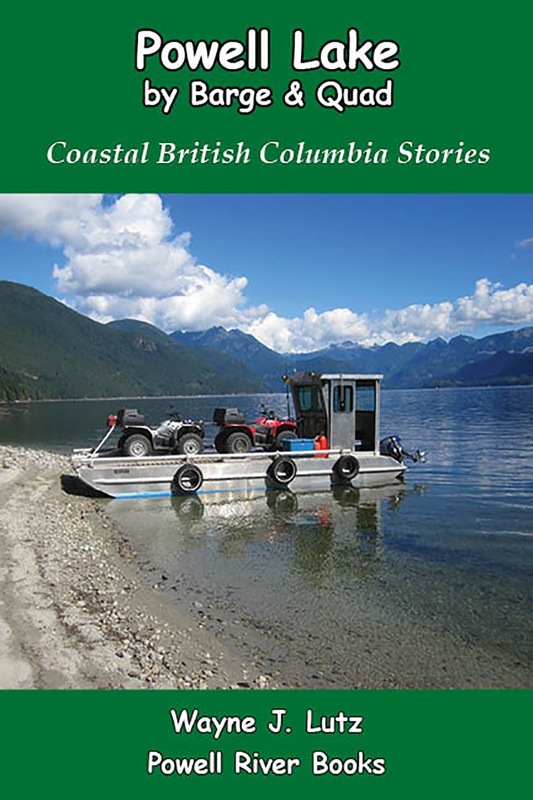 Pick up a free Powell River Living magazine or Powell River PEAK to see what's happening around town. 8. Cozy retreats and homey B&Bs. Up and down the Sunshine Coast you will find signs directing you to great out-of-the-way places to stay. South of Powell River look for Kent's Beach or Garnet Rock if you have an RV. Pull off at the seaside Suncatcher B&B or the Oceanside Resort and Cabins, or immerse yourself in history at the Townsite's Old Courthouse Inn. If you are headed north of town to Okeover Inlet, stay in your own cabin in the woods at the Desolation Sound Resort and grab one of their fall specials. 7. Romantic restaurants. Powell River is well known for its many excellent restaurants. The atmosphere may be casual, but the settings are romantic and food is excellent. The Laughing Oyster on Okeover Inlet is well worth the drive. Make reservations for a sunset dinner at the Eagles Landing Bistro or the Savoury Bight. And there's nothing better than a table at the Shinglemill Pub ovelooking spectacular Powell Lake. 6. Writers and artists abound. You will find lots of talent in Powell River. 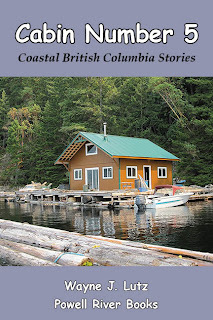 Read all about us in books like Desolation Sound by Heather Harbord, Hulks: The Breakwater Ships of Powell River by John A. Campbell, or Coastal BC Stories by Wayne J. Lutz. 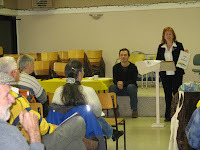 Come join us at the Fall Writer's Conference with guest speaker Sylvia Taylor on October 17. 5. The Historic Townsite. Powell River was founded as a mill town for the Powell River Paper Company. The homes are now privately owned and the Townsite was designated a National Historic District by Parks and Monuments Canada in 1995. 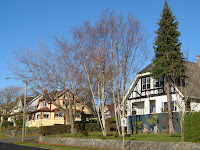 Discover Powell River's history at the Museum near Willingdon Beach and stop by the Tourism Powell River Visitor Centre for a walking tour guide of the old homes and other historic buildings. 4. Events and Festivals. There's lots to do around here in the fall. Check out the community calendar at PowelRiverDirect.com. 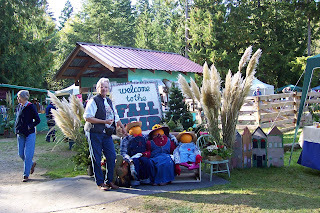 The Fall Fair is September 26-27 at the fairgrounds. Catch wonderful art films at the historic Patricia Theatre in October and the Festival of Trees in December. Watch Around Town in the PEAK for opening and special event dates. 3. Lots of year-round outdoor activities. Whether your favourite activity is boating, fishing, hunting, hiking, ATVing, winter sports, kayaking or just relaxing, Powell River has it all. 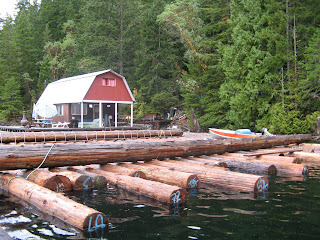 Popular Desolation Sound anchorages and forest campgrounds are almost empty for the hardy outdoor enthusiast. But be careful, you might come for a weekend, but stay for a lifetime like we have. 2. Golden sunsets and hillsides. The maple trees in are turning and the hillsides have golden mantles. They are only outdone by the magnificent fall sunsets. Powell River is built along the waterfront with sweeping views of the Strait of Georgia and Vancouver Island. The Seawalk is a great place to take in the view. Maybe you'll run into Wendy taking some of her excellent photographs. 1. Heading up the lake. Powell Lake is my home. Wayne and I live up the lake in all seasons, but fall is one of our favourites. You can rent a float cabin like this one to experience life on the lake for yourself. 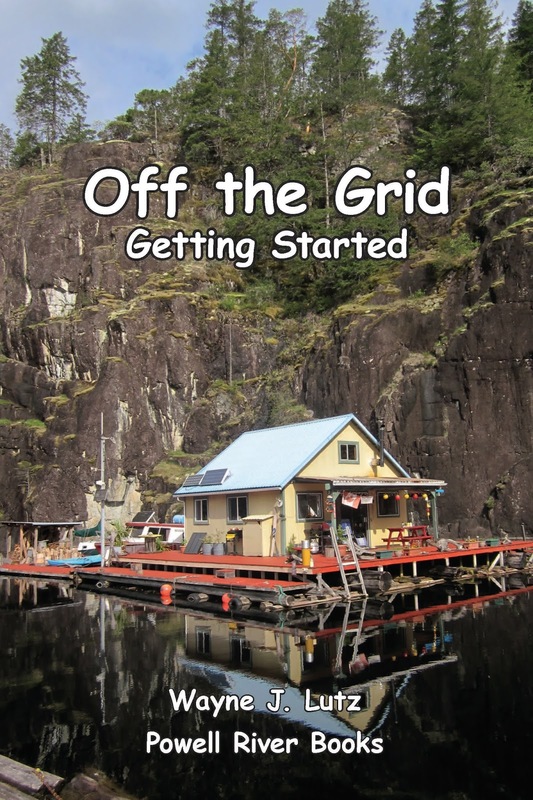 You can also read about off the grid living on Powell Lake in Up the Lake and Farther Up the Lake available at www.PowellRiverBooks.com. This sign appeared at the Shinglemill gas dock on September 8, the day after Labour Day. Logging companies have built roads throughout the Powell River back country. The larger roads are called mains. We drove south of town to take a ride on the Lois Lake Main. This well maintained dirt road is posted for logging activity 24/7, but typically work is limited on weekends. Even though our ride was on a Saturday, we took extra care to keep an eye out for possible traffic. Not only did we not see a logging truck in four hours, we didn't see another person or vehicle. A beautiful summer day and we had everything all to ourselves. Lois Lake Main Branch 1 is well marked with yellow mileage signs. We parked our truck and quad trailer close to kilometre 1. Heading up the main, we got peak-a-boo views of Lois Lake through the trees. Just like Powell Lake, it's low after a long, hot summer. Just after we passed the head of Lois Lake, we headed southbound up the river valley. This is the same path that the new Plutonic Power hydro lines are following. At one point, an extremely long uninterrupted span rises to a mountain pass and disappears beyond. Laying that line (most likely by helicopter) must have been an experience. Along the way, we stopped at Scanlon Creek for a rest in the shade by the rushing water. What a refreshing find on a warm day. It starts at Brooks Lake, our destination for today. They are named for Dwight Brooks and Michael J. Scanlon. Their logging company came to Powell River in the early 1900's and was instrumental in the early days of the paper mill. At the head of the river valley we popped over the ridge and were greeted with a broad view of the chuck (ocean). It always amazes me how close things are in the back country. The normal way to get to this point is by driving to Saltery Bay and taking the ferry to Earl's Cove. And here we are, only about an hour from our ride's starting point. Looking south you can see the opening to Jervis Inlet, one of the massive glacial carved fjords along our coast. We left the main to go up an old logging road to Brooks Lake. The first part of the road was a rutted two lane trail through second growth forest. After we passed the new hydro lines, it narrowed even more. At a particularly steep hill I stopped and let Wayne go ahead to the lake. He wasn't able to get there either due to a large tree blown across the trail. We decided to retrace our steps to the truck to make it back to town early. You see, there was a USC vs. Ohio State University football game on TV. Goes to show, you can take the city out of the man, but he will still "fight on!" This year I grew tomatoes in pots. I have one Roma and two cherry tomatoes. Early in the season, there were just enough for salads and grilling. When they come in faster, I froze some for winter soups. Then all of a sudden, my cherry tomatoes turned ripe overnight. What was I to do with too many tiny tomatoes? They aren’t the best variety to can, but I did. I washed, cut and put then into a big pot to cook over low heat. With larger tomatoes, you dip them in boiling water and skin them before stewing. Not so easy with the little guys. I used a wire whisk to mash them and release their skins as they cooked. When they were soft, I poured them into a strainer over large bowl. I used the wire whisk to force the pulp through the fairly large holes. Then I used a spoon my fingers to pick out as many of the small skins as possible. They curl, making them easy to spot and pick out. Yes, it was tedious but worth it. I returned the juice and pulp to the large cooking and followed the recipe from the Farm Journal’s Freezing and Canning Cookbook for Meatless Spaghetti Sauce (page 244). I didn’t have enough tomatoes so I cut my recipe in half. I like chunky spaghetti sauce, so I peeled and diced four of my Roma tomatoes to add to the stewed mixture. I cooked the onions in the oil until translucent and added them to the mixture, followed by the remaining ingredients. It was too sweet for my taste. Next time I’ll reduce or eliminate the brown sugar. I also added a small green pepper and extra herbs to taste. Everything simmered with occasional stirring for one and a half hours until thickened. In the meantime, I boiled the water in my canning pot and immersed the jars and lids to sterilize them. I poured the sauce into hot half pint jars (a better serving size for us) to ¼” of the rim. I wiped the rims clean, placed snap lids on top and screwed the rings on to finger tight. The jars were then processed in a boiling water bath for 20 minutes. Last week, Wayne and I wanted to take a “wimpy” quad ride all on our own. We call a short (time and distance) ride a wimpy ride. Even though we’ve had our quads for several years, we aren’t that familiar with the trails around Powell River. We’ve been cautious about heading out on our own, but now we have two tools that give us more confidence. 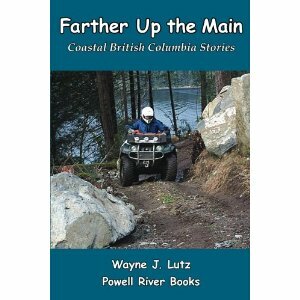 One is a great map book written by Dave, the president of the Powell River ATV Club. It’s called the ATV Trail Guide and costs $25. If want a copy, you can contact Dave through the ATV/BC website. All profits support trail maintenance and building activities. The other item is a Garmin Oregon 300 GPS. We went to visit George (Mr. GPS) at Marine Traders. He’s a Garmin expert and can help you find the right model for your needs. We purchased the topographical maps on a card and the City Navigator North America road maps on a CD. That way we got the software to save and manage routes and waypoints. The Oregon 300 works with both Mac and PCs. Since we use Macs that was very important for us. We parked our truck in town near Edgehill School at the top of Abbotsford Street. This is where the Wednesday trail group often starts their rides. We never guessed how beautiful the trail through the forest from this non-descript parking spot would be. Tall evergreen trees provided lots of shade for the lush fern and salal ground cover. There are many interconnecting trails in the area, so we used both map and GPS to stay on course. Along the way there was active logging, so we were watchful for trucks and other big equipment once we got to the logging road section. From the Washout Trail we took Fred’s Trail down to Hammil Lake. Again, it is well marked with a wooden sign attached to a tree, but you have to watch for it. Fred’s Trail is narrow in places with larger roots to negotiate, but it is still in the easy to moderate category. Just after we entered the trail, we came to a bridge constructed by ATV riders over a fish-bearing stream. This is an example of how riders in the area respect and help preserve the environment. After our long, hot summer, there was no water left in the stream. We continued on Fred’s Trail to the Hammil Lake trail and followed it a short ways down to the lakeshore. Today the weather was cool and breezy, se we skipped a swim. Wayne tried a few casts while I had a pop and cookie break. My mom is visiting me in Powell River this month. When the weather is nice, she comes up to the cabin, along with her (our) cat Stick Tail. They both enjoy getting out in the fresh air and sunshine. But when the weather is a bit cool or rainy, she and the cat enjoy the pleasures of our condo in town. I come down the lake every few days to check on how things are going and to have a girls day out. We usually go shopping for groceries or just browse through the Economy Shop thrift store. Mom loves a bargain as much as I do. After we've "saved" lots of money by making our purchases there, we splurge on going out to lunch. Last week we went to the Savoury Bight Seaside Restaurant at the Beach Gardens Hotel just south of town. Mom isn't a big eater, so we usually share a sandwich. They were very gracious about it, and even served our meal on separate plates (at no extra charge). The Savoury Bight is on the ocean side of the hotel with a view of the marina and the Malaspina Strait beyond. It's a great place to come on a sunny day so you can sit outdoors on their patio. If you come at sunset, you get a wonderful view with Texada and Harwood Islands in the foreground and the colourful sky reflected in the sea. The pub side also serves meals and drinks in an informal atmosphere.